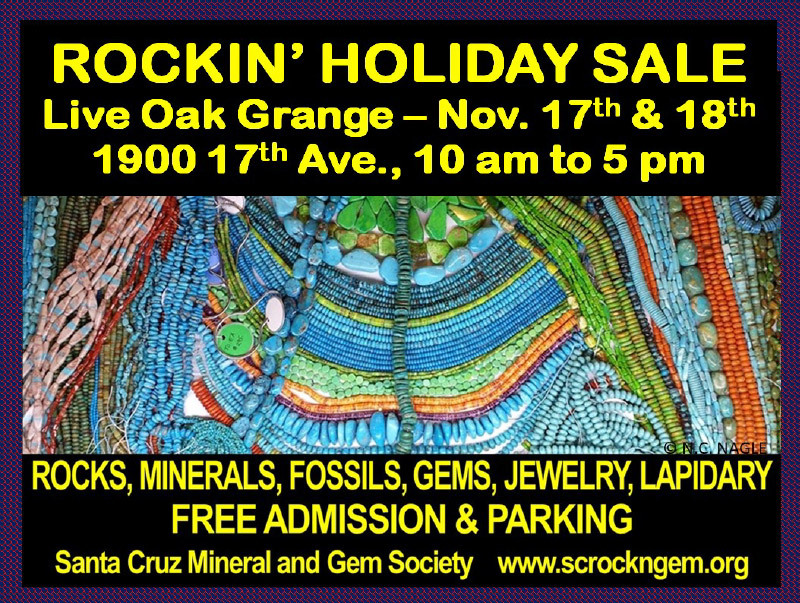 demonstrations on gem and rock cutting, faceting and cabochon making. Educational Activities are an important objective of SCMGS is supporting and fostering education regarding geology, lapidary arts, jewelry making, and earth sciences. Meetings are held the second Wednesday of each month at 7:00 PM at the Live Oak Grange Hall , 1900 17th Avenue in Santa Cruz (Live Oak). 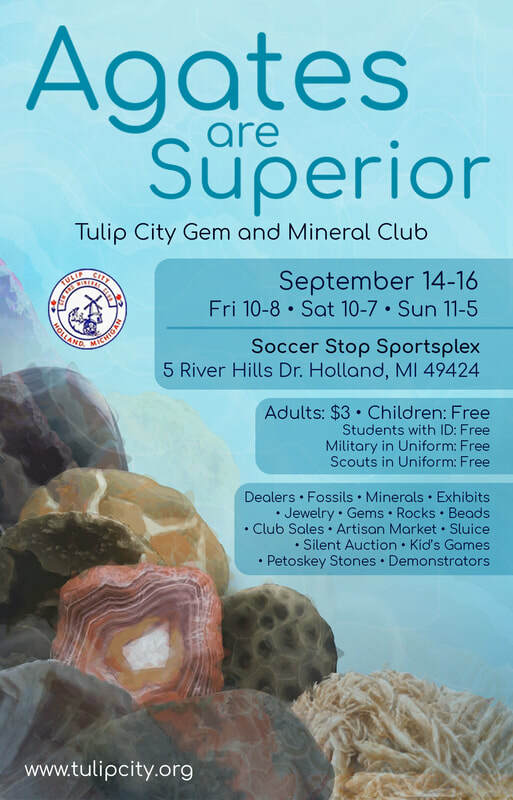 Tulip City Gem & Mineral Club presents their 49th Annual Show: “Agates are Superior!” in Holland, Michigan. 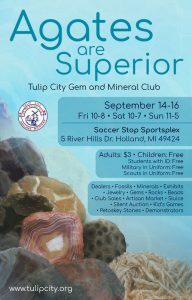 Details at http://www.tulipcity.org/ Collect special rocks, fossils, jewelry and beads by visiting 10+ Dealers, Artisan Market, Silent Auction and Club Sales. View special displays by A.E. Seaman Mineral Museum, GVSU and Hope College. Enjoy Kids Games, Sluice, Fluorescent Tent and club members’ personal displays. Interact with the Lapidary Arts demonstrators. You will find common, strange and precious treasures to take home! Does your gem, mineral or fossil club or society need new members in your ranks? How about new guests to your gem, mineral and fossil shows? 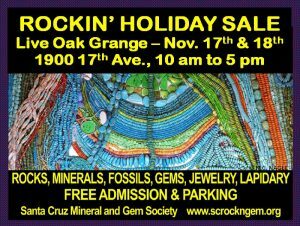 Would you like rockhounds and gem, mineral and fossil enthusiasts to travel across state lines to visit your show? More importantly, would you like exponentially more traffic to your club’s homepage or the show’s homepage? 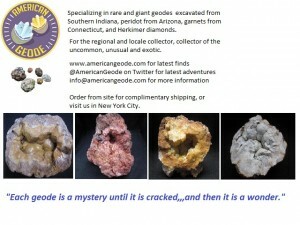 American Geode can help. 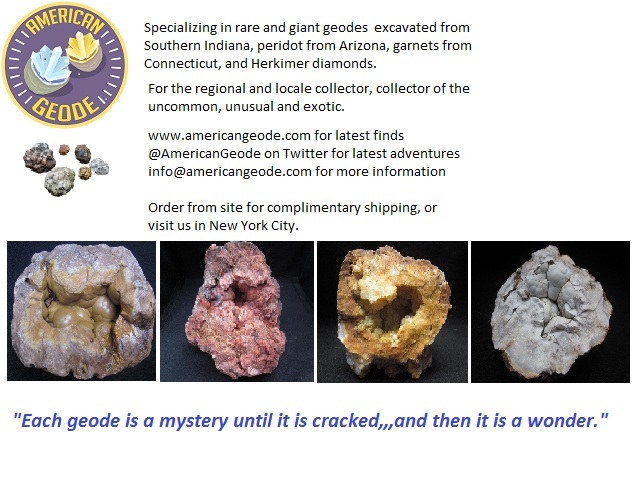 Between 3000 and 10000 rockhounds and gem, mineral and fossil enthusiasts visit our website each month. They also contact us for suggestions on clubs to join, and mineral shows and events to attend. First of all, other mineral websites charge between $600 to $1000 per year for a banner ad on their site. In contrast, we charge a flat rate of $150 for 12 month basic partnership and offer much more than other mineral sites. Send us two banner ads, 728×90 and/or 150×150, that we will post on our website. As an add-on service, send your club announcements and show announcements for us to post over our famous American Geode Twitter with 10,000+ rockhound followers, fans and friends. 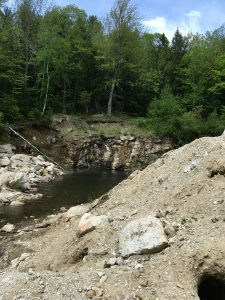 Rockhounding in Maine, is some great rockhounding, in fact some of the best rockhounding the American Geode team has ever experienced because of the ease and accessibility of the Maine mines! 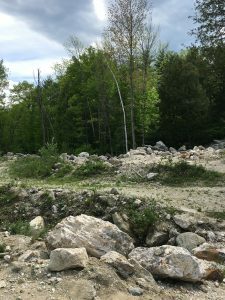 American Geode went on a rockhounding (and foodie) tour of Maine in May 2018, and found the quarries very accessible, easy to find, and full of mica. Driving: From jct. of Rtes. 117 and 118 in Norway, go west on Rte. 118 for 0.95 mile. Turn right onto Greenwood Road and drive north west 5.30 miles. Turn right onto Richardson Hollow Road and continue 0.40 mile to parking area on the right. 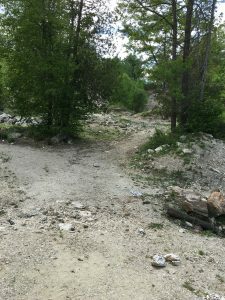 Waisanan Quarry and Tamminen Quarry are .1 miles further down the road. The American Geode found plenty of fine mica, and had a great time, and the reason we did not find other minerals as that we simply ran out of time. 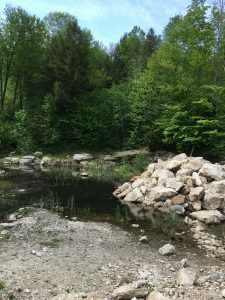 We suggest setting aside the day for rockhounding and exploring the area. A cheap dop-kit or toiletry kit is a great idea. Why? Because often times they are waterproof, and have zippers. You can wash them off too. Places like Target, Marshall’s, K-Mart, or Sears will carry inexpensive options. Mosquito coils and matches are necessary, and we suggest having a minimum of 7 with you at all times. The bugs can be fierce no matter where you are. 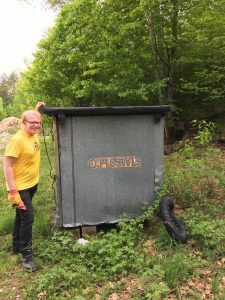 Mosquito coils last for hours and will burn away into ash. Sunscreen is essential even in the outdoors. Bring the SPF Protection most suitable to how fair or how dark you are. Rockhounding can get very dirty, so bring Wet-naps as they are very handy to clean off your hands quickly. They come in small travel packs. For some rockhounds they are too astringent to apply to one’s face, but personally I find it very refreshing. If you wear glasses these are very good for keeping your lenses clean, too. Energy bars, candy bars, bananas, oranges, apples, and nuts are great for keeping up your energy and last the entire day. The wrappers are minimal waste to carry back, and the nut-shells, orange peels, and apple cores can be disposed of by Mother Nature. Small notepad and pen or pencil for keeping notes. Date, time, location, and details of your gemstone finds quickly fade the mind due to excitement. This information is essential for gemstone and mineral finds, since provenance is paramount to us and to our clients, and should be for you as well. Cell-phone or mobile device charger – while you are driving to the locale, or the night before, making sure your devices are fully charged. You should place a call to family and loved ones before heading out and if you are running late. It is highly advised to put these items in protective zip lock bags to PROTECT from dirt and mud. Additionally, filming your finds can be a great way to record you adventure. 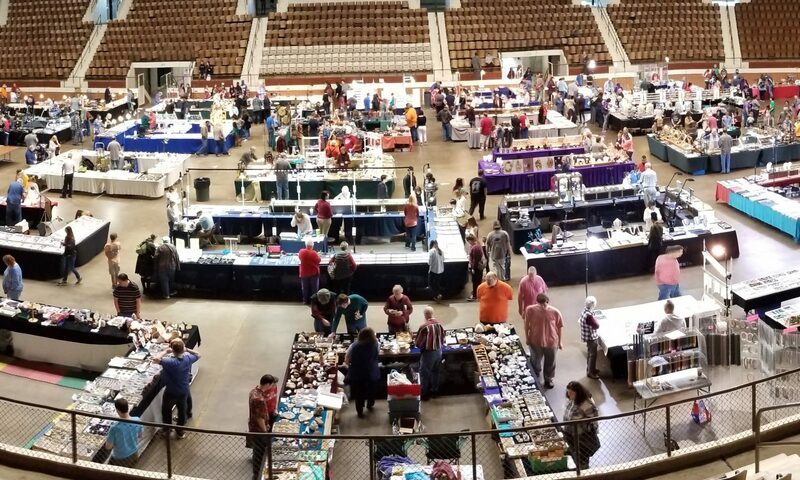 Grand Junction Gem & Mineral Club presents the 71st Gem & Mineral Show! The Grand Junction Gem & Mineral Club, Inc. is affiliated with the Rocky Mountain Federation of Mineralogical Societies. 81502 The Club is a nonprofit, 501(c3) tax-exempt, educational organization. classes are posted in the newsletter.